Following their defeat in the Battle of the Coral Sea, the Japanese attempted to capture the strategic Port Moresby on New Guinea's southern coast with an assault across the Owen Stanley Mountains. For five months Australian and Japanese troops battled along the narrow Kokoda Trail, across appalling terrain of high mountains and through thick jungles. Both sides suffered over 6,000 casualties, and the campaign became known as "Australia's Thermopylae." 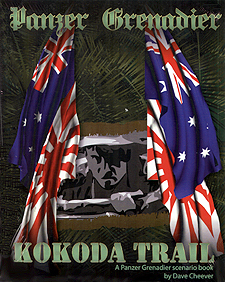 Kokoda Trail is a supplement for the Panzer Grenadier series, focused on these strategically vital battles in the middle of nowhere. There are 30 new scenarios, or game situations, and two new maps of the jungle and mountain terrain over which the campaign was fought. This is not a complete game; ownership of Afrika Korps and Guadalcanal is required.